Are you tired of using those heavily scented air fresheners? If you are then you need to give Fresh Wave products a try. FreshWave products are a great way to naturally get rid of pretty much any smell. There are many different products to try from Fresh Wave including sprays, crystal gels, candles, vacuum pearls and pearl packs. I feel like my house is always filled with different odors, some good but most not so pretty. Lets face it having two dogs, two little boys and a husband can create lots of odors. 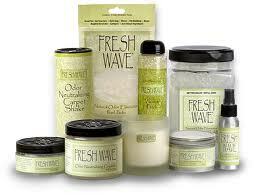 When I first tried Fresh Wave I tried the crystal gel jar. I was hoping to get rid of the dog smell when you first walked into my house. There was no heavily perfumed smell, my house didn't smell like flowers or the beach or any other overly unnatural smell. When I went outside and walked back in for the first time I was amazed there was no dog smell. My house just smelled fresh and clean. The crystal gel will usually last about two months which mine did. This product is amazing and even won the iparenting media award. Fresh Wave products can be found on their website www.freshwave.com. You can purchase them there as well as learn more about them. The products can also be purchased at Bed Bath and Beyond. I received the Fresh Wave products from HouseParty. If you have not joined House Party yet check it out at www.houseparty.com.